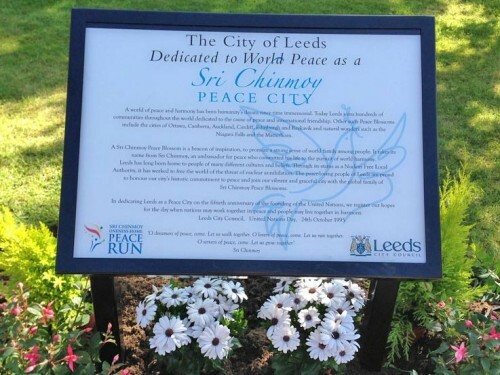 On Saturday 17th May, the city of Leeds was re-dedicated as a Sri Chinmoy Peace-Blossom, during a ceremony attended by the Mayor of Leeds and members of the Peace Run who are travelling through England. Leeds was initially dedicated as a Peace City in 1995 on United Nations day, 24th October 1995. 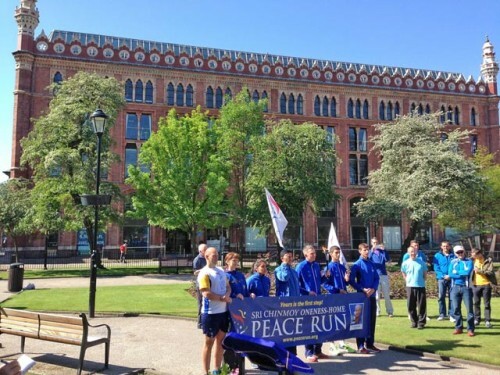 This May, the Sri Chinmoy Peace Run is travelling through England and up to Scotland as part of the European Peace Run. With the run passing through Leeds, the city of Leeds kindly agreed to make a new plaque and honour the Peace Run. 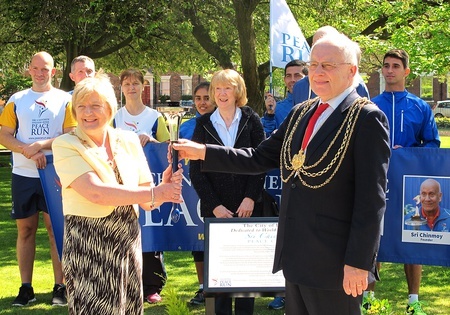 The Lord Mayor of Leeds Councillor Tom Murray unveiled the plaque and spoke welcoming the runners and affirming the city of Leeds’ commitment to diversity, tolerance and the promotion of peace. The Lord Mayor of Leeds and his wife Edna.